Born on July 14, 1871 in Kalamazoo, Michigan, to Judge George M. Buck and his wife, Annie, Gertrude Buck received all her higher degrees from the University of Michigan: a B.S. in 1884, M.S. in '95, and a Ph.D in rhetoric and composition in '98. She joined the Vassar faculty in 1897 as an English instructor, and rose quickly within the department, becoming an Associate Professor in 1901 and a Professor in 1907. She taught at Vassar until her death in 1922, and she revolutionized the English department while also making a name for herself as a talented rhetorician. Modern rhetoricians and feminist scholars have found in Buck's writings the beginnings of feminine rhetoric. The study of rhetoric is the study of communication. Long overlooked, this field of study has seen a recent reemergence. Buck's individual work in rhetorical studies laid the foundation for the recent rise of New Rhetoricians, scholars who believe that writing is a social action, and communication is a community experience. Miss Buck considered language a fundamentally social instrument used to further an organic conception of society, and thus approached writing and teaching democratically. She believed, "Only as we relate other people's experiences and ideas to our own are we able to see what we have to contribute, however small it may be, to the sum of human consciousness." A former student recalled of her class, "At no other time have I, for my part, held the appreciative attitude toward the environment in such constant activity." The student spoke of Miss Buck's insistence on sincerity, a standard that Buck applied to herself as well as her students. She held all writing to a standard of truth, for she felt, "Without sincerity, no writing can be good literature." The result was a body of work universally recognized for its detailed insight and mastery of description. A colleague described her poems as "delicate and poignant in beauty." Another said of Buck, "Her originality depended upon her power of turning an exceptionally lucid logical faculty to the task of escaping from its own abstractions and cleaving through to the truth of human experience." The impressions of Miss Buck held by her colleagues continue to hold sway among contemporary scholars. Colleges and universities throughout the country still study Buck's writings on literary criticism and rhetoric. Her textbooks and articles illustrate the fundamentals of writing and teaching, while her poetry and prose expose neglected artistic talents. The 1914 edition of Woman's Who's Who of America and the 1921 edition of Who's Who Among North American Authors both included articles on Buck's achievements, and she was posthumously mentioned in the 1943 edition of Who Was Who in America. Unfortunately, Miss Buck's scholarly and creative achievements were relatively few. Always a frail woman, Miss Buck focused her limited energies upon renewing and reinventing the curriculum at Vassar rather than building up a portfolio of work. When she wasn't working on campus, Buck spent her time connecting with the Poughkeepsie community. She lived in the city of Poughkeepsie with her closest friend, and head of the English department, Laura Wylie, foregoing the usual campus habitation for a home that allowed her active participation in local issues. The two women worked together in the community, first as members of the Equal Suffrage League of Poughkeepsie and then on the board of directors of the Women's City and County Club. Buck also became a member of the Socialist Party of the State of New York. President MacCracken described the "creative group" of his faculty, which included Miss Buck and Miss Wylie, when he said, "… Dangerous women all of them. They rejoiced in every conflict of ideas. The times were ripe for change." Buck and Wylie capitalized on the new President MacCracken's impression of their "creative group" and his progressive mindset. Together they radically changed the methods and courses of the department, forwarding the methods and ideas of John Dewey. They drastically reduced class sizes, and petitioned year after year for an expansion of the faculty, bringing such notable professors as Hallie Flanagan Davis to campus. The variety of writing courses swelled during Buck and Wylie's time at the college. Miss Buck taught a wide array of the courses, teaching a class until she understood the most efficient way to convey the material, then writing a textbook and guiding a new teacher into her place. This strategy assured the survival of her ideas and methods beyond her immediate association with the material. Buck's impact on Vassar extended beyond the English department. In 1915 Buck participated in George Baker's 47 Workshop at Radcliffe College, the playwriting course that is considered the beginning of the student theater movement. Upon her return, she created the first playwriting course at Vassar, and, in 1916, guided the Vassar Dramatic Workshop into existence. The Workshop arose from the playwriting course as a chance for students to write, produce, and act in entirely original productions. The second performance of the workshop featured senior Edna St. Vincent Millay as writer and star actress. It was such a successful program that President MacCracken created a drama fund of $1,000 in 1918 to support future endeavors. After Miss Buck's death in 1922, the fund was renamed the Gertrude Buck Drama Fund, and earmarked for the "purchase and care of books on drama and allied themes." Though a Drama Department did not exist during Miss Buck's time at Vassar, this fund, and the workshop that motivated it, laid the foundation for the Division of Drama that would be established in 1934 by Winifred Smith '04. The Workshop inspired Professor Buck to fuse her campus and community efforts by founding the Poughkeepsie Community Theatre. President MacCracken observed, "She had long carried on her plan of an association with the community by residence on Market Street and by participation in town life. She wished now to bring Poughkeepsie the fine art of drama in connection with the little theatre movement." With the Community Theatre, Buck hoped to create an environment in which all social classes worked together to find self-expression. According to MacCracken, "Miss Buck's method was always stimulation of the inner motives, so that the results should be the actual product of the group engaged in the activity. The result of her efforts was the development in Poughkeepsie of a group genuinely devoted to the art of the theatre." Considered by Gertrude Buck and her colleagues as her greatest achievement, the Poughkeepsie Community Theatre probably also hastened her physical decline. The efforts of founding a quality community theater took their toll on Miss Buck, who was never a strong woman, and in August 1921, a sudden paralytic stroke cut her work short. As a Christian Scientist, she refused treatment, and for months she suffered through a partial recovery. On January 8, 1922, Gertrude Buck died from a second stroke. Gertrude Buck was not forgotten. The home she had shared with Miss Wylie became the headquarters of the Women's City and County Club in November 1933, in recognition of both women's dedication to the organization. On August 29, 1976, a group from the Drama Department, English Department, Development Office, and the office of the Secretary of the College dedicated a plaque to the memory of Professor Gertrude Buck in the lobby of Avery Hall. Finally, in 1984 the Rhetoric Society Quarterly officially recognized Miss Buck as a talented rhetorician whose work paved the way for modern rhetoric studies. Miss Buck's legacy continues today in Vassar's commitment to small class sizes, innovative teaching methods, and Vassar's widely acclaimed Drama Department. Biographical File. 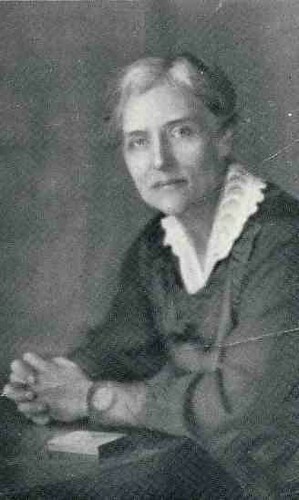 Gertrude Buck. Vassar College Special Collections (VCSC). Biographical File. Gertrude Buck. "Through the Campus Gates" by Katherine Warren in the Vassar Quarterly, May 1922. (VCSC).